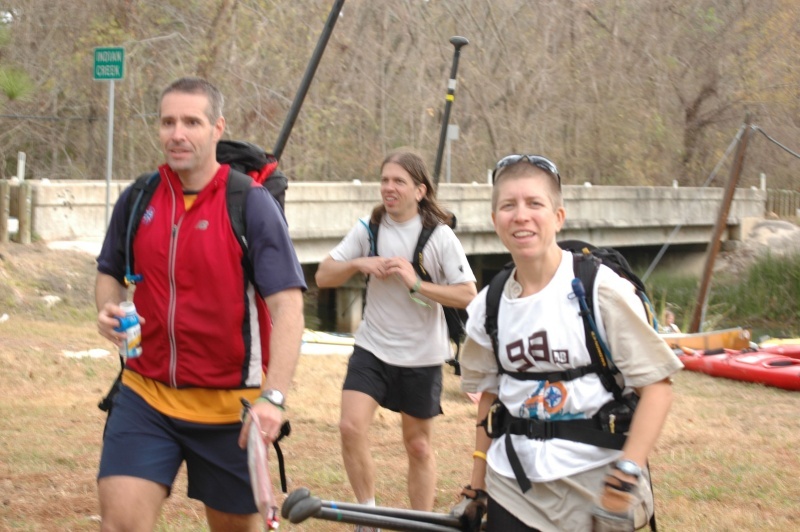 Team Vignette (Marcy, John, Kip and I) decided to do the DB AR (formerly known as the Texas Dare AR) this past weekend. It was a rather last minute decision, but we decided we would do it just for fun. 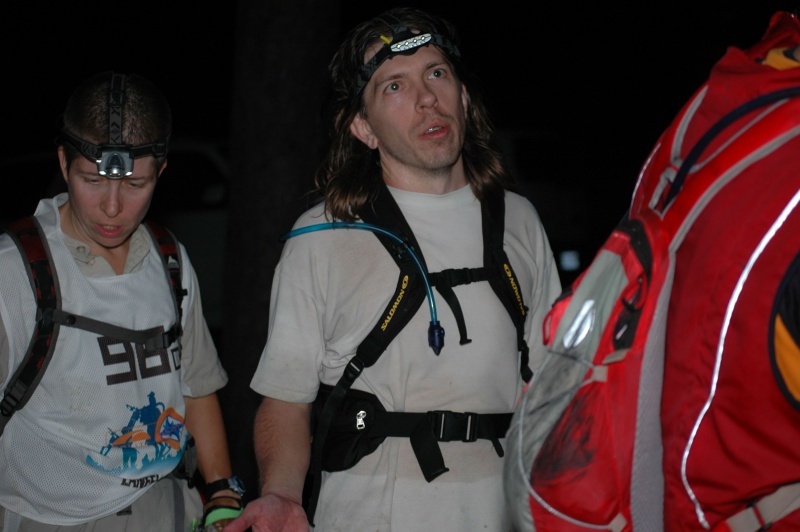 Kip and I had run the Sunmart 50 mile trail run the weekend before, so we were not recovered for any super hard effort. Marcy agreed we would just race for fun (that is how the hardest efforts always start….). 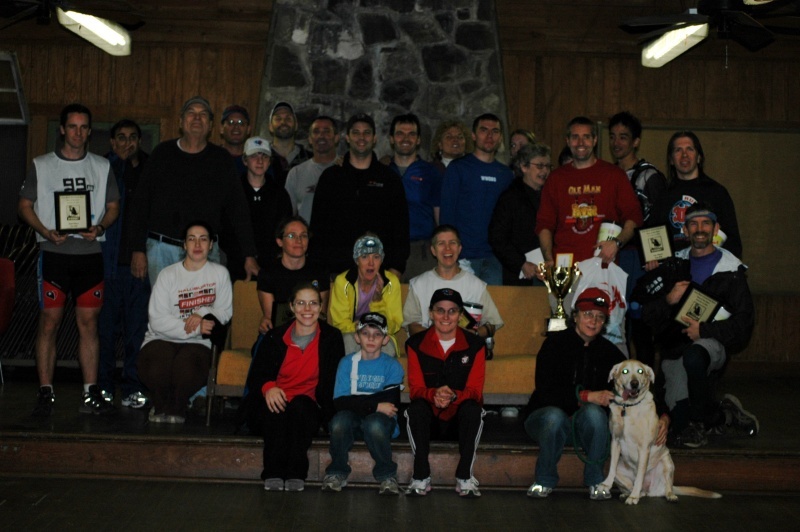 This race was to memorialize David Boyd. His family was at the race to start the event and cheer on all the teams. It was nice to meet the family behind such a great person. 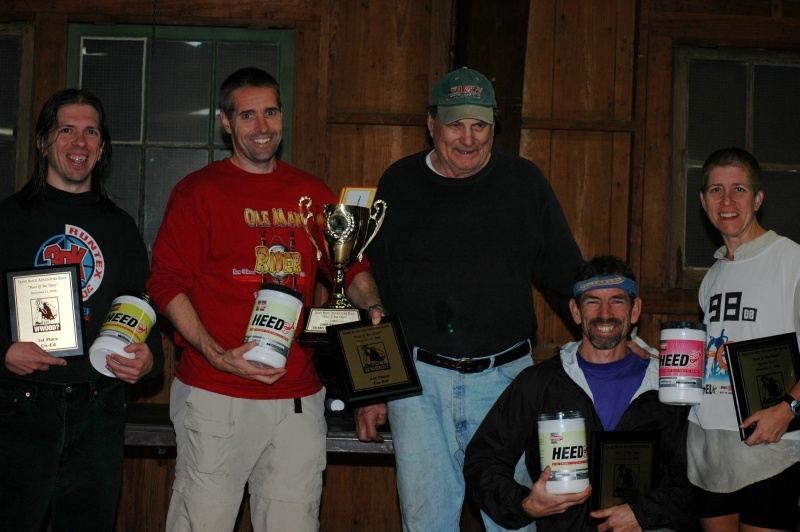 We have raced behind MOAT (Dave Boyd's team) for many years and they are always just top-notch people and super friendly. We arrived at the park (Sam Houston National Forest) the night before and just planned to camp as it was too far to drive the morning of the race. We had a nice dinner in New Waverly before arriving (including some very tasty carrot cake as my form of carb loading). We arrived at the park and were instructed to drive to the boat drop and drop off our boats, but we could not leave paddles or PFD's with the boats. We took care of that and then had our second dinner at a local café in Coldsprings Texas. We ran into one of the race directors there and had a nice chat, with the big concern being the wind conditions on the lake for the paddle section. Lake Livingston is very large and if the winds were up, the conditions could be rather difficult. Race morning was nice and chilly with temps just under 40 F. As we all figured we were awoken by all of the local Houston racers coming into the transition area the morning of the race. We got up nice and leisurely and waited around for the race start. There were 2 races actually going on at the same time, a sprint and the 12-18 hour race (we were doing the long course). There were about 12 teams doing the long race and many teams in the sprint category. We were told we would be doing a marked trail run to start (along with the sprint teams) and then we would be given our next set of instructions for the race. 30 seconds before the race started, Marcy gave us our instructions that we were not planning to run too hard and get caught up in a foot race with all the sprint racers. This was fine news to me, as I knew my legs would be sluggish. We took off with tons of other folks at the sounding horn for our trail run. Within about a minute, we entered some single-track trail and that became a huge bottleneck as many of the sprint racers sprinted out and then were walking and really slowly a few minutes later (ugh). We worked our way through the crowds and our pace increased. In reality I am sure it was not that fast. We all figured after the opening run we would be biking the roads to the paddle put in, so we might as well run hard and then recover on the bike. The trail run was between 4 and 5 miles in length. At the very end of the run, we actually caught up with Team MOAT who was leading the long course race. In TA, we got our instructions and points to plot. Sure enough it was a boating leg, so as Kip plotted points, I got my pack on with my pfd inside and strapped my paddle to my bike. As we were about to leave, someone pointed out that we were not biking to the paddle, but instead we would be running to the paddle! We all let out a collective "ugh" about that. In actuality, our team is comprised of pretty good runners. We are certainly better runners than bikers, but it was all paved roads to the boat drop, which would have been perfect for biking. So now we got to run with our paddles, pfd's and other gear. We were the first team out of transition and now we were leading, but we knew that would not last, as MOAT would surely be catching us soon on foot. The run was about 7.3 miles to the boat drop. The distance was fine for us, but after running hard for the first run and this run being all pavement, it took a toll on our feet. None of us are accustomed to running on pavement with packs these days. MOAT caught up with us on the run and we all chatted a bit. It was nice to see those guys and they told us a few Dave Boyd stories along the way. MOAT was then off in front of us as we finished up the run. The wind was really picking up as we ran along, which made us all rather nervous for what was to come. Soon enough we arrived at the boat drop and were greeted by a volunteer who informed us MOAT was 4 minutes ahead. He even congratulated us on our win in Vegas at the GUR Las Vegas Championships 2008 which was rather unexpected. The first part of the paddle was quite nice down Indian Creek. It was a windy inlet to the main lake. As we got closer to the lake, the water became progressively rougher and with winds heavier. We could see MOAT off in the distance. They are incredible paddlers so they were putting distance on us quickly. As we hit the main lake, the water got very rough. I was paddling with Kip and told him I thought it would get better once we got into the lake. I figured the waves would become more consistent as they were coming from all directions. We had about an 8k paddle across the lake to an island in the middle of the lake for a few trekking points. Kip and I began discussing if we should abandon the paddle due to the very rough conditions. It was very cold out and the water temperature was also rather low. We lost sight of MOAT, which was odd as we were all going the same way. Kip then pointed out the reason: MOAT had flipped their 4-man boat and they were now all in the water. Marcy and John were about 30 meters away from us and we pointed out MOAT to them. We knew we had to help but just hoped we could get everyone back safely without us flipping also. As we approached MOAT, Rick in the safety boat was whistling and flagging us to turn around. They had not seen MOAT but as they got close to us, they were also able to spot the down team. MOAT was unable to right their canoe in the very rough water. Two of the MOAT members were swimming towards shore and two were with the boat. We elected to get the 2 swimmers and let the safety boat help with the MOAT boat. We grabbed one of the swimmers, but it was far too rough to try to get her into our canoe, as we were all confident we would end up swimming also. We had her hold on to the back of the boat and we paddled to shore. It is rather difficult to move quickly when you are dragging a person. Patti was rather cold, but in good spirits. We got her to a boat dock and got her out of the water (that was a challenge in itself with the high boat dock and no ladder). Kip and I got our boat on land as Marcy and John pulled up to the same dock with another swimmer. We managed to get him out of the water. They were all very cold so we gave them all of our dry warm clothes. We got the second of our boats out of the water as the safety boat towed MOAT's swamped canoe into shore. We got the last two MOAT members onto dry land along with their boat. As we were helping to get them warm, the safety boat flipped over, so it was time for another rescue. This was a small flat boat with motor. We managed to get it up over the sea wall and onto shore. After we confirmed everyone was safe, we launched our boats again for more punishment on the rough water. The paddle was canceled for all other teams, but we wanted to paddle back to the boat put in. Soon enough we were off the main lake and back into the sheltered Indian Creek area. MOAT was at the boat drop when we got back. (The race director had called for a vehicle to drive them from their water rescue location back to the boat drop.) They were trying to get warmed up by a fire. We repacked our paddles and PFD's, as we were required to run back to TA with them. We set out for our 7.3 mile run back to TA. With all our paddling diversion, and the other teams skipping the paddle, we now found ourselves at the back end of the race. It was fun to see other teams on the run back. We were all still running well, so we passed quite a few teams on the way. We even saw one team eating pizza at a gas station on the run back. As we approached TA, we saw several teams biking towards us for the bike leg. In reality we were not that far behind these 3 teams. In TA we got our next set of instructions, which was a biking leg around the forest. All of it looked to be on old trails and forest service roads. The first point was an easy out and back from TA. We saw 2 of the 3 teams that we had seen while running into TA. We wondered what happened to the third team. We figured they might have taken one of the roads that were off limits (it was not a real time advantage to do that, so no worries), or maybe they had gotten lost. As we got back to TA, we knew we had to head east to find an old road on the map, but there was nothing on the map that actually connected to where we were going. There were lots of trails near the TA and we had run on the road we were shooting for at the beginning of the race. In our first attempt, we did not go correctly and ended up semi lost so we headed back to TA. In doing so, we had to cross a thigh deep swamp, and yes it was cold and MUDDY!! This effort wasted a good 20-30 minutes. On our second attempt we were much more careful and tried to retrace our opening trail run course to find the road. This worked out well, so now we were back on track. We strongly suspect that other teams had trouble with this section also, as we caught several teams soon. Marcy and I did the bike navigation, which worked out very well. There is minimal topography in this part of the park, so we used distance and direction heavily. It all worked out as we found the CP's with little problem. This was actually a rather fun bike section as we went down old trails/roads that were overgrown and had lots of down trees. This required us to get off and on our bikes rather frequently. We managed to pass several teams by this alone. Some teams really seem to take a long time simply getting off and on their bikes. We saw Bob, the co-race director, at a road intersection and he told us there was only one team ahead of us. That was cool that we had caught up to almost everyone. He also mentioned they would be giving us a time credit at the end for our efforts during the paddling section. At one point, we were following on old pipeline that abruptly ended at the Lone Star trail. That trail was off limits for bikes, and it went the wrong way. We debated on turning around. It was about a 1 kilometer bushwhack from here if we were to go on through the woods (and we had bikes). About this time a couple other teams caught up to us. There was no real good backstop for navigation and no contours to work with in the area. We decided to at least take a look. It appeared that the reason the pipeline ended was a creek cut through and it likely had just eroded everything away. We crossed the creek and shortly after the creek the pipeline trail re-emerged, so we were off again. We found the next CP without incident. The final CP for this leg had a clue of "railroad" for the location. This was odd to me as there was no railroad shown on the map we had, and the trail we were on surely did not look like any old railroad grade. Oh well, we found the point based on distance, but that clue was still a mystery to me. We then headed back to TA. We were able to find our way back to TA much more efficiently compared to the start of this leg. Back at TA, our next instructions were to do another biking leg. This was a flagged 8 mile bike section, but there were no checkpoints. This is just kind of odd as there was no way to really prove that teams did the bike leg other than honesty (and most all adventure racers are honest). There was a spot near the end that would have been very easy to cut off the trail and head back [especially now that we had figured out that intersection - Marcy]. Kip was tired on this leg (and for those that don't know, Kip hates biking). It was a fun section of trail in that it was all very flat and very easy to ride. I sure would have rather run this section and biked to the boats earlier in the race. As we neared the end of this section, a team came up behind us and passed. It turns out it was Team MOAT. They were back in the race. We were all glad to see they had warmed back up. Unfortunately as Nathan Winkleman passed me on the trail a vine grabbed his handlebars, causing him to be ejected into my bike path. I think I only ran over him a small amount (sorry). He bounced up and rocketed off in front of me not to be seen again. We hit TA and plotted our last leg which was several trekking points. We loaded up on lights and some spare warm clothing. We left with MOAT and headed out. It was fun to run along to the first CP with those guys. Another of the HART teams was also with us when we got to that CP. The next CP was up a side drainage off a creek. We chose to follow the creek for a while then head up the drainage. MOAT was with us for most of it. As we got close, all the teams in the area kind of did their own thing. When we were within about 100 meters of the point we came across a HART team coming the other direction. They mentioned that they held us off as long as they could (it was the team that was leading the race). We got the point and headed back to the creek, spotting MOAT on the way down. We assume they had some trouble locating the point, as we did not see them again for a while. We quickly caught up with the HART team. Marcy asked if we were all feeling good enough to run for a while (which we all were). As we crossed a pipeline we punched our next CP along with the HART team. Back at the pipeline, we upped the pace to a run and left the other team. Now we were in the lead so we figured we better keep the speed up, as we knew MOAT could run us down with ease. The next point was the same railroad bike CP from earlier, so we knew exactly where it was. We ran, punched the point, and then turned around. This point was an out and back down an old road so we could gauge where other teams were. On the way back we came across the HART team. Then a little after that we came across MOAT. We calculated if we could run the remainder of the race we could likely hold off the other teams, but with no room for error. Marcy led us on road and then the Lone Star trail to the final CP. There was a shorter route, but that would involve a 1 km bushwhack, and the underbrush in this park was very thick. A couple teams did bushwhack to try and save time, but it cost them time instead, as the moving was so slow. Soon enough we were at the last CP on the lake near the TA. We punched it and headed to the finish line. The final run was a run around to the other side of the lake. We came across a few weird sites on that run (I don't think I was hallucinating yet). There were folks dressed like Indians beating drums, and then some folks carrying candles wearing monk robes??? We then crossed the finish line first to take the win. There was a large crowd on hand to cheer us at the finish line. It was getting cold and we were all a bit wet, so we started to load up gear into the van. We showered and then went to the awards ceremony. It was nice to see the other teams that finished. We were presented with some nice awards. We said our thanks and got on the road to home. Thanks to HART for putting on a fun race.